And, for the life of me, I have no idea what Cleveland is going to do. The Browns head into this draft armed to the teeth in crucial picks. Two first-rounders, both within the top 15, including the No.1 overall selection. They have eleven selections overall, six in the first four rounds. If you haven’t picked up on it yet, this is a crucial draft for Cleveland. In fact, it’s quite possibly one of the most important drafts this franchise has seen in a long time. If the team’s front office can hit on the majority of its picks, the Browns will have a solid core of talent to build upon. Another weekend full of blunders could be a devastating setback. So, it goes without saying tomorrow night begins a draft Cleveland cannot afford to blow. As you know, the Browns are in the middle of a massive rebuild, one which required ripping this team down to the studs. Vets were purged, a roster laced with inexperience was thrown on the field and numerous draft picks were collected. It was a necessary step, sure, but one which put a lot of pressure on the front office. You can only take such drastic steps to reshape a franchise if you hit home runs with the pile of draft picks you’ve assembled. This, of course, means using the first overall pick on consensus top player Myles Garrett. It also means potentially resisting the urge to trade up from No.12 to grab a quarterback. I’ll go a step further – I’d avoid taking a quarterback in the first round even if the choice was to stay at No.12. I get the fact the Browns haven’t had a franchise QB since the Ronald Regan presidency. That said, whether it be Mitch Trubisky, Deshaun Watson or Pat Mahomes, this class simply isn’t talented enough to merit spending a top 15 pick on a QB. Betting big on a player who might not be ready to be a franchise quarterback would likely become yet another failed attempt to fix this team’s biggest problem. It would also be another way in which this team could screw up a make or break draft. Simply put, the Browns cannot reach this weekend. They cannot gamble. They cannot fall under old habits of trying to outsmart the NFL, throwing out another ill-fated attempt to try and be the smartest team in the league. This is also not a draft where the team needs to appease the owner. 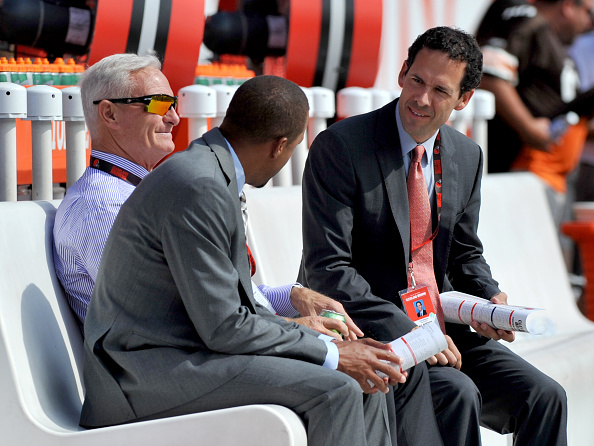 Jimmy Haslam should not be a key vote, nor should he have any say on who the team picks. He hired this front office to do that. His input should be seen as welcome, but not influential. That all of the aforementioned negative outcomes have occurred in almost every Cleveland draft in the past few decades is why there’s so much anxiety about tomorrow. We’ve seen what happens when this team throws caution to the wind, or makes picks based on who the owner wants. All it does is set the franchise back. However, to bumble this upcoming draft would have a catastrophic impact. The Browns very rarely have an opportunity like this, a chance to utilize what seems like countless valuable picks on plug-and-play talent. To instead use these selections on ill-fitting projects or questionable rookies could derail this expansive rebuild to a point where it has no chance to succeed. It would also likely be the first step towards yet another offseason house-cleaning come next winter. So, Cleveland, I can’t encourage you enough to finally take a smart approach to what everyone refers to as this team’s Super Bowl. To do otherwise, to once again force your large group of regrettably die-hard supporters to watch another failed attempt to build a contender, would be too much to bear. It could also force another reset on a franchise which has already seen far too many.